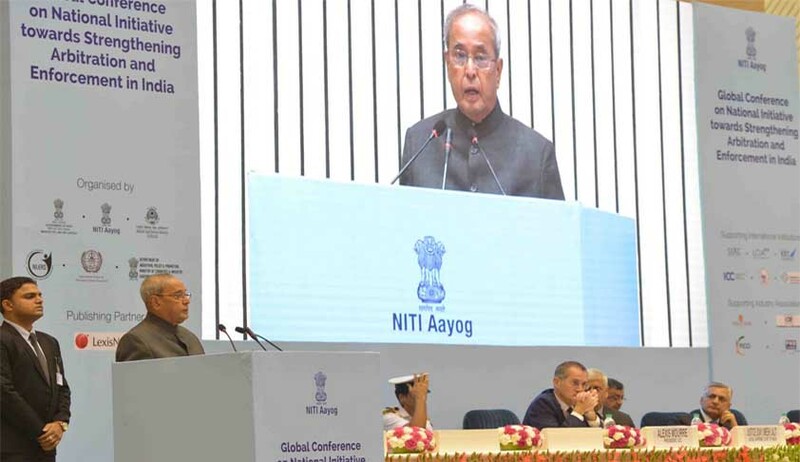 The President Pranab Mukherjee Today stated that while India has the basic legal and physical infrastructure to support international arbitrations, we need basic institutional reforms to strengthen our arbitration framework. He was inaugurating the Global Conference on ‘National Initiative towards strengthening Arbitration and Enforcement in India’ in New Delhi today. He added that three institutions are particularly critical for strengthening arbitration in India arbitral institutions, judiciary and the government. “Lack of a centralised state-based institution like the judiciary gives flexibility to arbitration. But it also increases costs - if for each and every dispute, the parties have to separately draft rules, appoint arbitrators, procure administrative support services etc, the cost of dispute resolution would naturally be much higher”, said Mukherjee. He also said that for arbitral institutions to expand their foot print, they need to partner with the Indian legal profession. A vibrant arbitration ecosystem would need a vibrant arbitration bar as well as a respected pool of seasoned arbitrators. Arbitral institutions need to proactively nurture and expand the pool of arbitrators to include subject matter expertise in sectors like infrastructure, energy, finance etc. This will in the long run help build confidence in the arbitration ecosystem in India. He added that although arbitration is an alternative to the judiciary, it cannot function without support from the judiciary either. “Judges have the delicate task of maintaining a balance between interference and over-interference. Indian courts need to devise an administrative mechanism to ensure that arbitration matters are handled separately and efficiently so as to avoid any delay arising out of judicial intervention”. He said. It gives me great pleasure to be amidst you this evening to deliver the opening address for the2016 Global Conference on National Initiative towards Strengthening Arbitration and Enforcement in India. We are gathered here today to set the stage for a global conference that is aimed at providing an international platform to deliberate upon the future of arbitration in India. It may be appropriate at this stage to first recollect our own experience with arbitration. As with most commercial laws, the first Indian statute on arbitration - the Indian Arbitration Act of 1899 - was modelled on its English counterpart - the English Arbitration Act of 1889. The 1899 statute was restricted in its application only to the three Presidency towns of India - Calcutta, Bombay and Madras. Cross-border enforcement of arbitral awards was not covered under the 1899 law. So the Arbitration (Protocol and Convention) Act, 1937 was enacted. It laid down the procedure for filing foreign awards, their enforcement and conditions of such enforcement. The operation of the law was based on reciprocal arrangements. (3) Provide that every final arbitral award is enforced in the same manner as if it were a decree of court. The working of the 1996 Act also led to various practical problems. Various committee reports like the 176th report of the Law Commission, Justice B.P. Saraf Committee, the Report of the Departmental related Standing Committee on Personnel, Public grievances, Law and Justice and the 246th report of the Law Commission highlighted these challenges. Ultimately, the Arbitration and Conciliation (Amendment) Act, 2015 brought in crucial changes to the 1996 Act to overcome the shortcomings. Legal reforms like these are certainly a step in the right direction to strengthen the arbitration ecosystem in India. Moreover, India has some inherent advantages compared to its other counterparts. The first of these is that English language is frequently used in courts and in arbitration matters which enables us to engage with the international commercial world of arbitration centred around London, New York and Singapore. Secondly, India has a diverse and rich pool of human resource, in law as well as in other disciplines. This human resource can help support and sustain the arbitration ecosystem in India. Thirdly, major Indian cities have the necessary infrastructure - airports with international connectivity, world-class hotels etc - to facilitate international arbitrations. While India quite clearly has the basic legal and physical infrastructure to support international arbitrations, we would, going ahead, need basic institutional reforms to strengthen our arbitration framework. Good laws themselves cannot substitute the need for good institutions. Three institutions are particularly critical for strengthening arbitration in India - arbitral institutions, judiciary and the government. Arbitral institutions help facilitate the core advantage of arbitration - the absence of a centralised state-based dispute resolution institution like the judiciary. Instead, arbitration allows decentralised dispute resolution through private market-based solutions. Parties can resolve disputes by a privately-constituted arbitral tribunal. It is typically made up of one or three arbitrators. Yet, the final outcome is an arbitral award that binds the parties. Lack of a centralised state-based institution like the judiciary gives flexibility to arbitration. But it also increases costs - if for each and every dispute, the parties have to separately draft rules, appoint arbitrators, procure administrative support services etc, the cost of dispute resolution would naturally be much higher. Arbitral institutions step in to mitigate these costs. They assist the parties with the appointment of the tribunal, and the administration of the proceedings. They take deposits on account of the arbitration costs and fix the arbitrator’s fees, remind parties and tribunals of deadlines, make arrangements for hearing facilities and so on. But unlike courts, they comprise a private competitive market of non-state institutions. Thus, institutional arbitration takes advantage of economies of scale to facilitate arbitration without imposing the rigidity of the traditional judicial institutions. Unfortunately, unlike advanced jurisdictions, institutional arbitration is still not widespread in India. Ad hoc arbitration is the norm. Although domestic arbitral institutions have come up, there is a huge untapped potential for growth of institutional arbitration in India. Both domestic and international arbitral institutions have to play a proactive role in shaping this market. For arbitral institutions to expand their foot print, they need to partner with the Indian legal profession. A vibrant arbitration ecosystem would need a vibrant arbitration bar as well as a respected pool of seasoned arbitrators. Arbitral institutions need to proactively nurture and expand the pool of arbitrators to include subject matter expertise in sectors like infrastructure, energy, finance etc. This will in the long run help build confidence in the arbitration ecosystem in India. The second crucial institution is judiciary. Although arbitration is an alternative to the judiciary, it cannot function without support from the judiciary either. Judges have the delicate task of maintaining a balance between interference and over-interference. Indian courts need to devise an administrative mechanism to ensure that arbitration matters are handled separately and efficiently so as to avoid any delay arising out of judicial intervention. Finally, I want to touch upon the role of the government in developing the arbitration ecosystem in India. State intervention in a market economy should be limited to situations of market failure - where the market left to itself cannot work out a solution. Private commercial disputes are not market failures by themselves. They can be resolved by the private parties on their own and businesses will continue. If the cost of private dispute resolution is willingly absorbed by businesses through private innovation, such innovations should always be encouraged instead of exhausting the judiciary’s resources. Therefore, the government needs to create an enabling framework for institutional arbitration in India. This conference provides an excellent platform to debate the pros and cons of such critical institutional reforms as well as potential strategies to implement them at ground level taking in account the interests of all stakeholders. Each session will try to answer two questions: What needs to be done and how will it be done? Seeing the collective wisdom and depth of experience of the panellists, I am certain that the answers to these questions will help generate concrete action points for each stakeholder which need to be implemented at the earliest to make India an international arbitration hub. With this, I welcome you all to the Global Conference on National Initiative towards Strengthening Arbitration and Enforcement in India. I wish you Godspeed and all success in your deliberations.